Here's a quick dinner, ideal for those nights when there's not much time to spend in the kitchen. Truth be told, I broke my foot a couple of weeks ago, and find that any time in the kitchen is too much! Consequently, I've been mastering quick, quick things to make for any and all meals. That, or it's out to eat. We had salmon the other night (grilled salmon is another meal that's quick, especially when my nice husband does the grilling), so I used leftover salmon in these quesadillas, canned salmon would work equally as well. Directions: Heat a skillet over medium high heat. Add olive oil, then vegetables. Cook for about 3 minutes, until the vegetables give up their juices. Add the salmon and heat. Remove the vegetable and salmon mixture to a plate. Return the skillet to the stove top, adding the second teaspoon of oil or butter. Place one of the tortillas on the skillet. Spread half of the vegetable salmon mixture over half of the tortilla. Top with 1/4 cup of the cheese and 1 teaspoon of the cilantro. Fold the tortilla in half. Cook for about 1 minute, until light brown, then turn over and cook the other side. Repeat with the second tortilla. Cut each tortilla into thirds, serving with lemon or lime, yogurt, guacamole, and salsa on the side. Stealthy Cooking Tip: Add a green salad for a complete meal. Here's a perfect example of how to increase your veggies and barely know it. Many quesadillas have on vegetables in them at all. 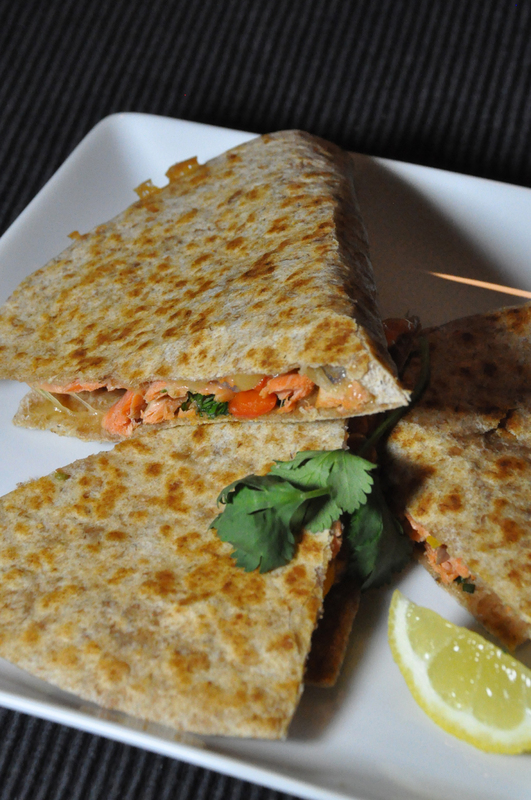 The addition of some veggies to the quesadilla increases your vegetable intake. Another advantage of increasing the vegetables, is that you're able to cut back on cheese with very little notice. Try using a "scant" 1/4 cup of cheese, not a heaping 1/4 cup.